This is my 20th of 31 reviews of Stephen King adaptations as part of the joint Blogathon that Darren (of Movie Reviews 101) and I are running this month in honor of the great horror writer. My Take on it – Have you ever wondered if you can trust someone completely? This movie takes that idea based on the real story of a married couple where the wife knew nothing of her husband’s secret and try to show us that it truly is possible and can happen. I have always liked Joan Allen’s work [especially in The Contender (2000)] and she has a strong screen presence here that shows us how things like this can unfold. She takes her character’s indecision to a high level and you never are 100% certain what she may do next. 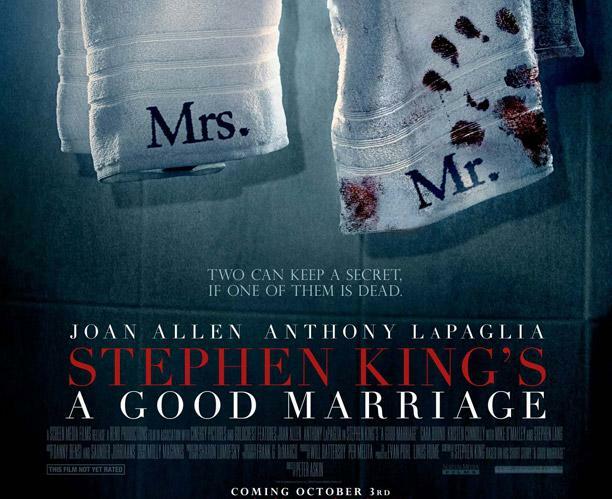 Anthony LaPaglia is great as her husband who is very clever about his secret, but ultimately may not be as smart as he thinks he is. Each of these characters have a dilemma to try and figure out about trust and having a loving relationship and it’s easy to see their thought processes when trying to decide how to move along in their lives. The thrills are worked into the storyline very well and you never quite are certain where things will be leading along the way, which keeps the suspense level quite high. Bottom Line – Great thriller that really shows how it’s possible to hide things from anyone if you truly wish to. Allen and LaPaglia have great chemistry together and their relationship feels believable. The dilemmas that these characters face are played out well and it’s very hard to see what comes next keeping the thrill level very high. Highly Recommended! I didn’t know about this one. Nice review.